Woodwork in the new family room (top) was stained to match existing beams, molding, and window casings in the formal living room. Adding on to an old house is always risky business. 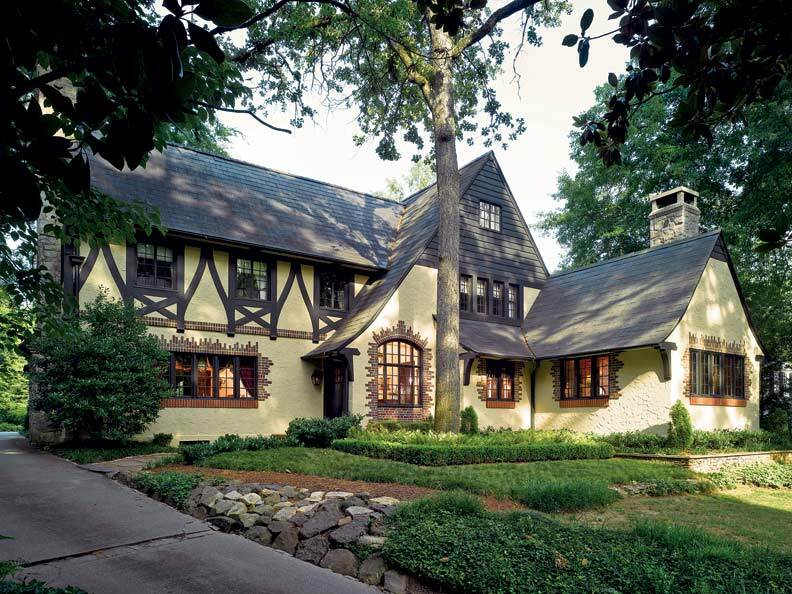 In the wrong hands, an addition can completely mar a historic home’s time-worn character. 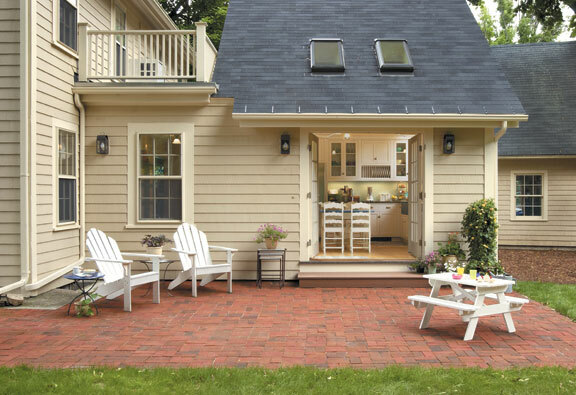 But when it’s done right, an addition can gently usher an outdated house into the 21st century. 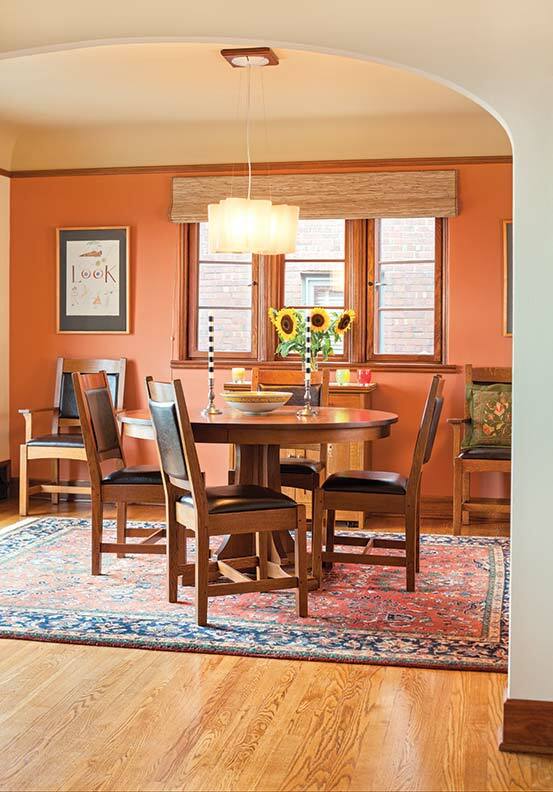 When Kris and John Mandler bought their 1931 Tudor in South Minneapolis, they knew an addition was in the cards. “It was a beautiful house, with a big backyard and views of a creek, but it had this tiny little kitchen and a really bad three-season porch,” says Kris. Instead of making the two-story addition an appendage on the back of the house, Eric and his team, which included fellow architect Chris Bubser and contractor Rick Reuter, stepped it back a bit and connected it with a cross gable. “It’s almost like a little village,” Eric says of the two parallel sections of the house. 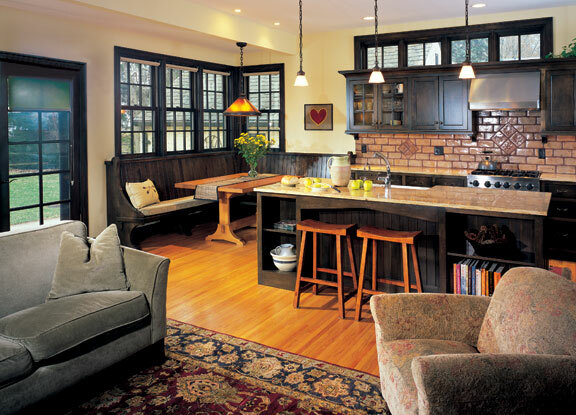 Eric, who creates furniture under the mantle Feenix Design, designed the kitchen’s island and built-in banquette. Matching the exterior of the addition to the original structure took some creativity. “All of the timbers on the outside of the house had been colored with creosote,” says Eric—an unusual improvisation the team had never encountered before. “It took us a little while to find a stain that matched.” He also brought in granite to match the original stone detailing on the front façade; Eric surmises that their supplier, 110-year-old Cold Spring Granite, located near St. Cloud, may have provided the original stone as well. 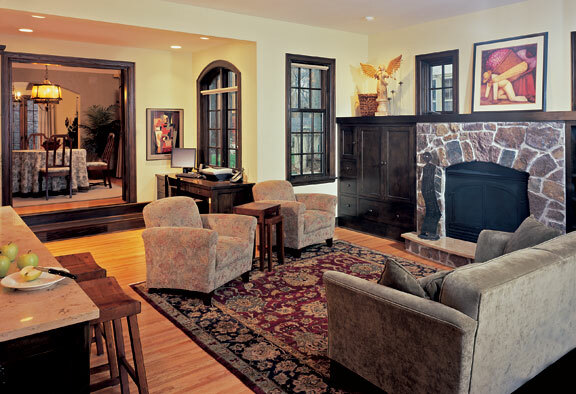 The handful of vintage granite that was removed when the three-season porch was cleared out to make room for the addition was repurposed as a small hearth in the family room. 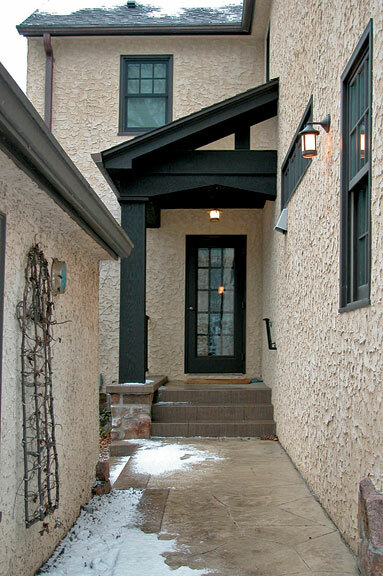 Inside the house, Eric took cues from the 1930s design, incorporating dark-stained woodwork, but using it sparingly. “For a Tudor, this is actually a very light house,” he says. Kris, who was particularly concerned about keeping the home’s airy feel, agrees. “There’s lots of dark woodwork, but it works because there are lots of windows, too.” Throughout the addition, Eric maintained that balance, setting off the stained maple window casings, molding, cabinetry, and breakfast nook with wide French doors, a corner bank of windows, and transoms above the cabinets. Recessed medicine cabinets, basket-weave tile, and 1920s-style light fixtures ground the luxurious master bathroom in the appropriate time period. Although the master suite on the second floor of the addition was a bit of an afterthought (“The kitchen and family room were the priority,” says Kris), with only one full bathroom in the house, the Mandlers soon acknowledged that it was necessary to accommodate their growing family. Its white-painted woodwork and neutral stone tile give the suite a more contemporary feeling than the downstairs space, but it channels the rest of the house thanks to period details like a sink vanity reminiscent of a sturdy farmhouse table. Online Exclusive:Check out our do&apos;s and don&apos;ts for adding onto a historic house.